Thank you for visiting official website of DAEJIN FILTER. 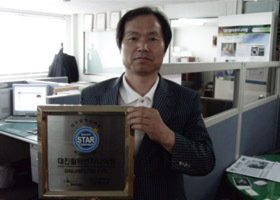 "DAEJIN FILTER ENGINEERING", Which managed to grow on the fountation of continuous concerns and trust of our clients, succeeded in development of NANO FIBER COMPOSITE FILTER through extensive research and development over prolonged period of time and is now about to be reborn under new company name of "DAEJIN FILTER". We will expand our business area to various applied products related with air & water pollution control system through continuous researches.